I presented on building a data driven security strategy at RSA this year. You can find the video here and the slides here. "Strategy is HOW YOU CHOOSE plans to meet your objectives, not the plans you choose. Those plans must be in the context of the rest of security and your organization. And a data driven security strategy is using MEASURES TO CHOOSE." This is just a quick blog to share my jupyter notebook analysis template. 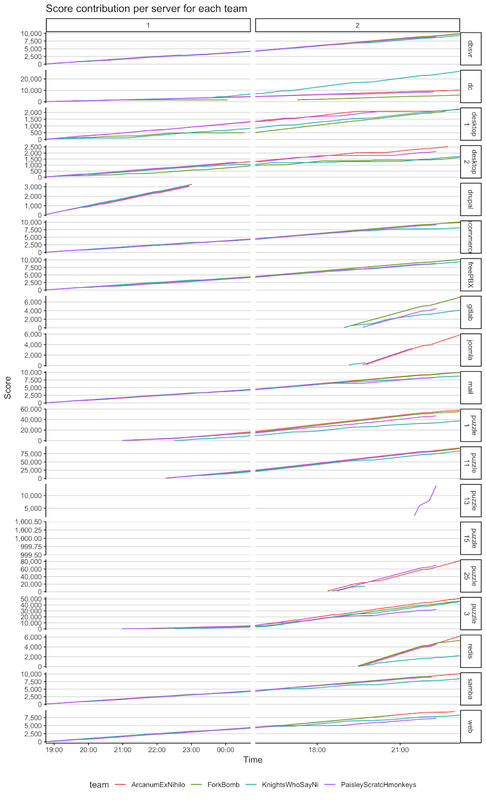 I analyze a lot of different datasets in a short period, so having the analysis consistent is very helpful. I'll walk through the sections quickly to share a bit about my process. In the title section, I have a block for any ideas to explore, specific things I intend to do, anything I need to request to be updated in the data, and any notes about the data. These are all bulleted text boxes. This section is VERY helpful for working on multiple datasets. it's easy to forget what you were going to do or what you've done and the summary up front helps get you back in place. next is preparing the data. No data comes ready for analysis. Here I have blocks to read in the data, clean the created dataframe, save it to an R data (Rda) object on disk, and then, the next time I need it, I just load the Rda and skip the cleaning. A description of the hypothesis being tested or explored. Something like "looking at the distribution of the periodicity of events". Once it's done, describe the results. Yes, the results should describe the results but you'll thank past you if you write down what you got from the analysis when you did it. Something like "it looks like the periodicity is bimodal with one mode representing X and another representing Y." Add a comment with a UUID. Seriously. Every. Single. Block. If it's something interesting you're going to put it in a document or a blog or something. You want to be able to track it from beginning to end. (Ours track from the report, through several drafts of the report, through drafts of the sections, to a figures rmarkdown file that generates all the figures, to an exploratory report where we created the original analysis.) Seriously. If you like it then you shoulda put a UUID on it. This is where I put all of the extra stuff. I always have a testing block. Throughout the analysis, you'll spend a lot time testing stuff to make it work, (or simply looking up things like the dimensions of your data and the column names). Putting those in a testing block keeps you from coming back later and wondering what the block in your analysis was there for. Sometimes you have big, ugly, lookups. putting them at the top clogs the Preparation section, so I tend to put them at the bottom. You'll remember you forgot to run them when your analysis fails. Really a parking lot for anything you don't want in another section, but don't want to delete. Ultimately, if I were doing full modeling, I'd probably want a template that follows the process outlined in Modern Dive. However, for someone just getting into analysis, hopefully this helps! At a more fundamental level though, we mean the scenario the CTF is meant to represent. As a blue team CTF, we try and simulate the real world. As such, starting last year, we began to transition our game model to simulate an economy. Score is not granted so much as transferred. For example, the gold team pays the gray team for accomplishing some task, then the gray team pays a portion of that score to the blue team for maintaining the services necessary to accomplish that task. Alternately, when the red team (or another blue team) installs a beacon, the score isn't lost, but instead transferred to the team that placed the beacon. 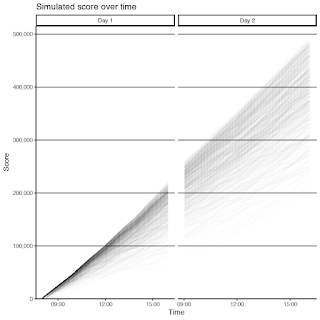 Beginning with last year, we have started to then simulate the way we expect the game to run. This year we have also captured detailed scoring logs. This blog is about our analysis of the score from this year's game and how it helps us plan for the future. 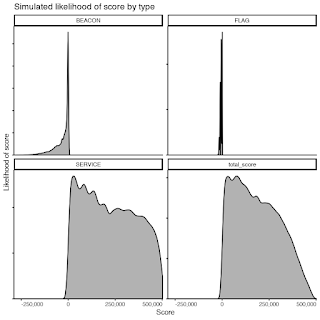 The first thing we do is create a game narrative and scoring profile for the game. 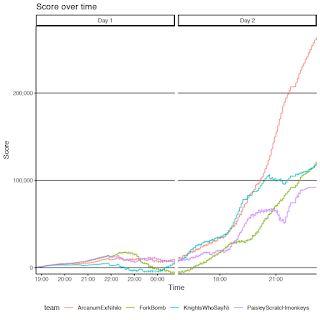 The profile is the servers that will come online, go offline, and how much they will be scored per (5 minute) round. It is picked to produce specific outcomes such as inflation (to decrease point value early in the game when teams are just getting going and to allow dynamism throughout the game). 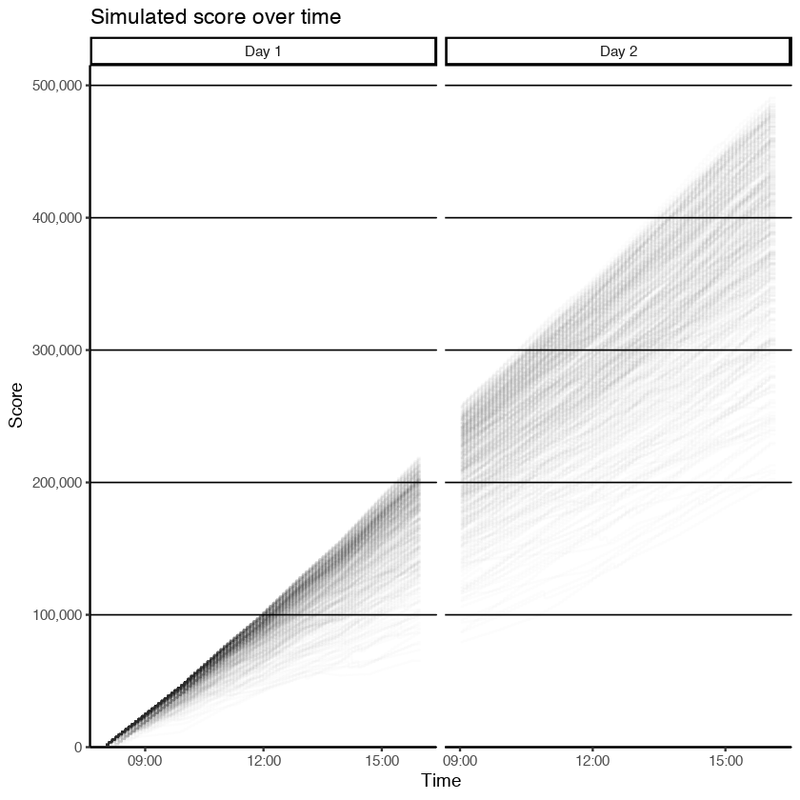 Based on this we ran Monte Carlo simulations to try and predict the outcome of the game. 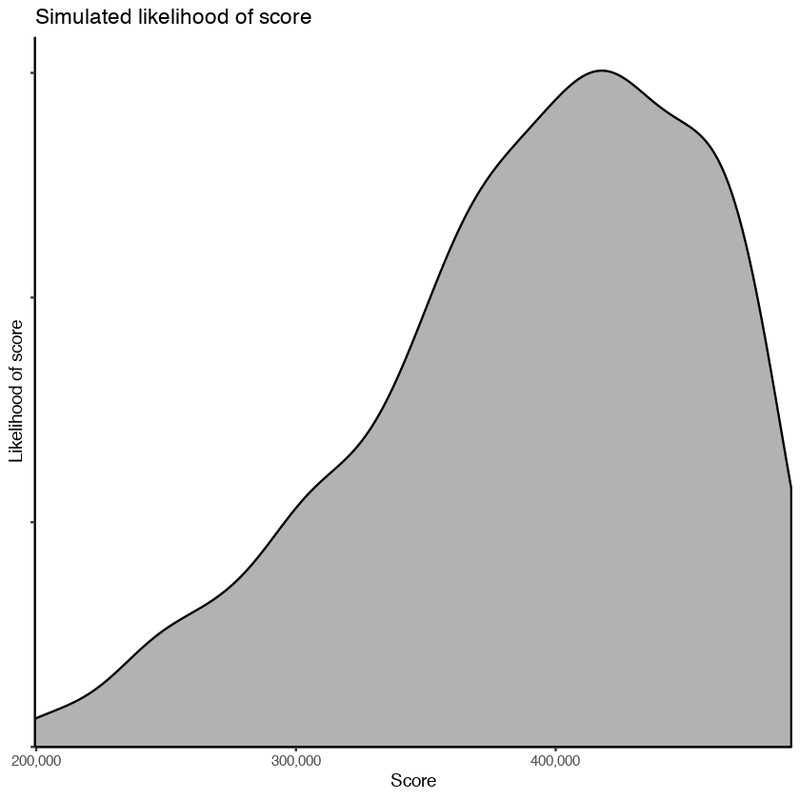 First, we analyzed the expected overall score. Next we wanted to look at the components of the score. And then we run the game. The short answer is, it's VERY different. We had technical issues that prevented starting the game on time. We were not able to complete some development that prevented automatic platform deployment, some hosts were not available, and some user simulation was also not available. This is not a critique of the development team who did a crazy-awesome job both rebuilding the infrastructure for this game in the months leading up to it as well as dynamically deploying hosts during the game. It's just reality. The scoring profile was built for everything we want. I am pleased with how much of it we got on game day. You can find the final scoreboard and scores here. It gives you an idea of what the game looked like at the end of the game, but doesn't tell you a lot about how we got there. I'm personally more interested in the journey than the destination so that I can support improving the game narrative and scoring profile for the next game. 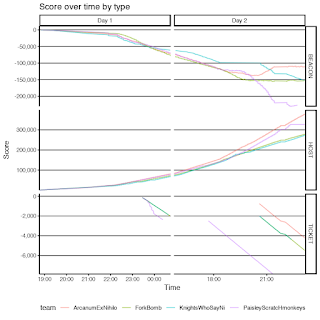 The first question is how did the scores progress over time? (You'll have to forgive the timestamps as they are still in UTC I believe.) What we hoped for was relatively slow scoring the first two hours of the game. This allows teams the opportunity to make up ground later. We also do not want teams to follow a smooth line or curve. A smooth line or curve would mean very little was happening. Sudden jumps up and down, peaks and valleys, mean the game is dynamic. What we see is a relatively slow beginning game. 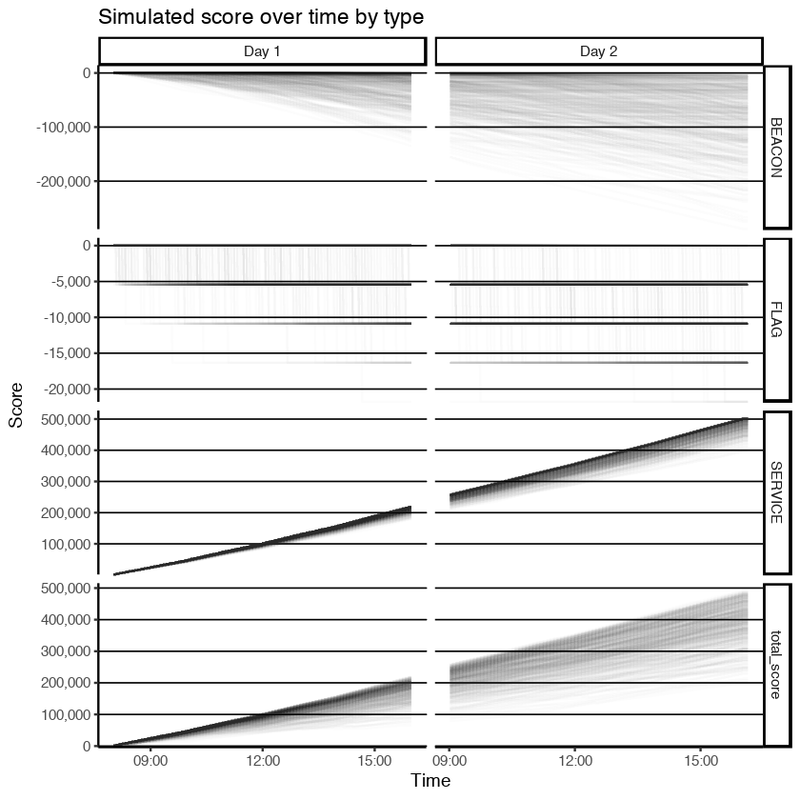 This is due to beacons initially being scored below the scoring profile and one of three highly-scored puzzle servers being mistakenly scored lower from it's start late in day 1 until it was corrected at the beginning of day 2. We do see an amount of trading back and forth. 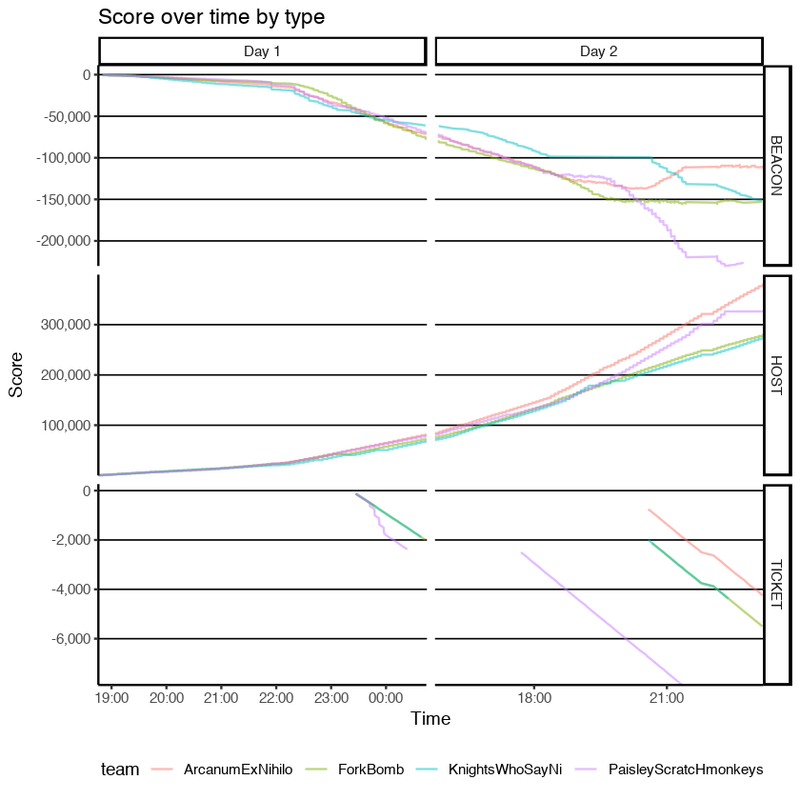 ForkBomb (as an aside, I know they wanted the _actual_ fork bomb code for their name, but for this analysis text is easier) takes an early lead while Knights suffer some substantial losses (relative to the current score). Day two scores take off. The teams are relatively together through the first half of day 2, however, Arcanum takes off mid-day and doesn't look back. The biggest difference is that when teams started to have several beacons, as part of their remediation they tended to suffer self-inflicted downtime. This caused a compound loss of score (the loss of the host scoring they would have had plus the cost of the beacons). We did not account for this duplication in our modeling, but plan to in the future. Ultimately I take this to mean scoring worked as we wanted it to. The game was competitive throughout and the teams that performed were rewarded for it. 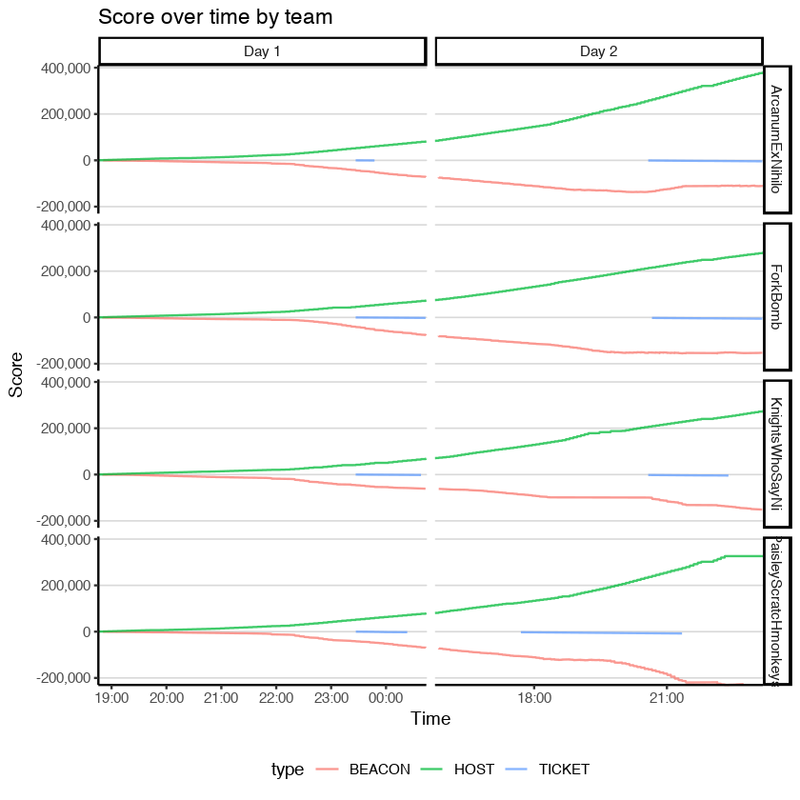 What we expect is relatively linearly increasing host contributions with a bit of an uptick late in the game and linearly decreasing beacon contributions. We also expect a few significant, discrete losses to flags. What we find is roughly what we expected but not quite. 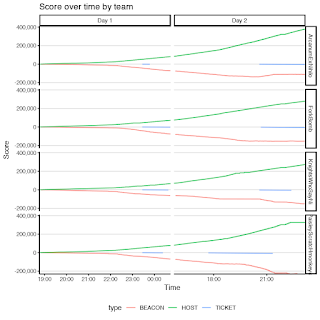 The rate of host contribution on day two is more profound than expected for both Paisley and Arcanum suggesting the second day services may have been scored slightly high. Also, no flags were captured. However, we do have tickets which were used by the gold team to incentivize the blue teams to meet the needs of the gray team. 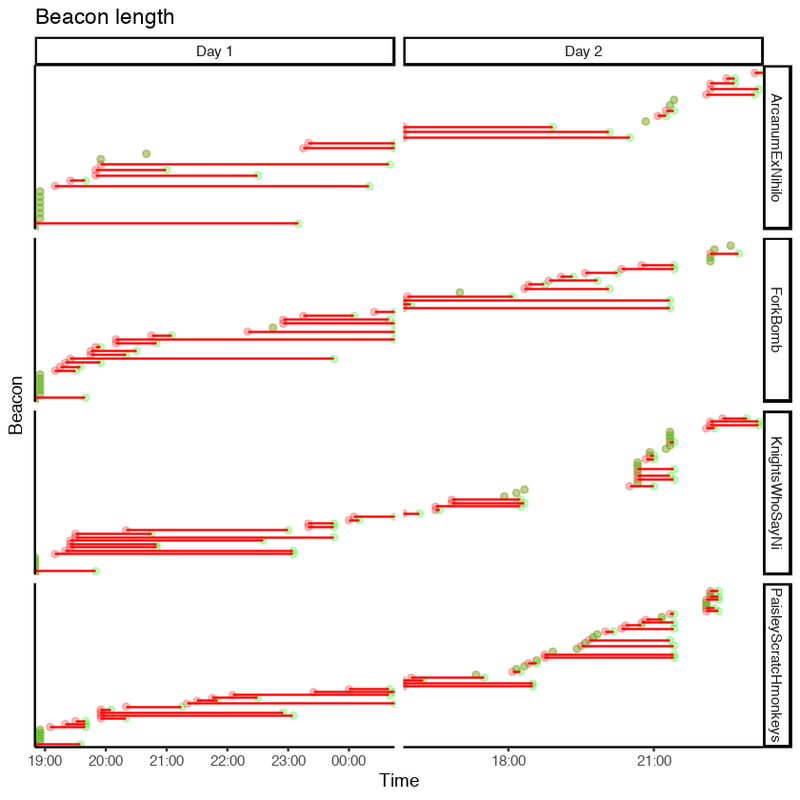 The biggest difference is in beacons. We see several interesting things. First, for a period on day two, Knights employed a novel (if ultimately overruled) method for preventing beacons. We see that in the level beacon score for an hour or two. We also see a shorter level score in beacons later on when the red team employed another novel (if ultimately overruled) method that was significant enough that had to be rolled back. We also see how Arcanum benefited heavily from the day 2 rule allowing blue-on-blue aggression. Their beacon contribution actually goes UP (meaning they were gaining more score from beacons than they were losing) for a while. On the other side, Paisley suffers heavily from blue-on-blue aggression with significant beacon losses. Ultimately this is good. We want players _playing_, especially on day 2. Next year we will try to better model the blue-on-blue action as well as find ways to incentivize flags and provided a more substantive and direct way for the gray team to motivate the blue team. Before we move on, two final figures to look at. 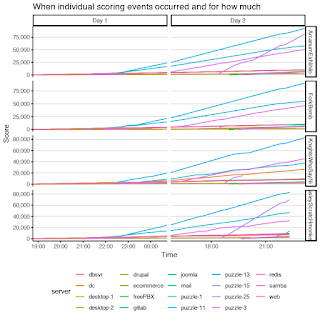 The first lets us see individual scoring events per team and over time. 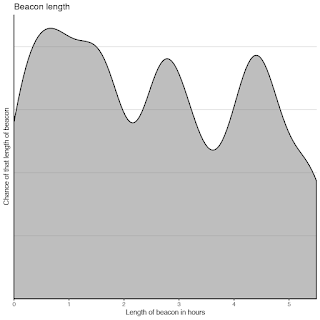 The second shows us the sum of beacon scores during each round. 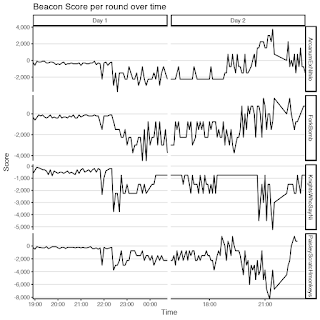 It gives an idea of the rate of change of score due to beacons and provides an interesting comparison between teams. 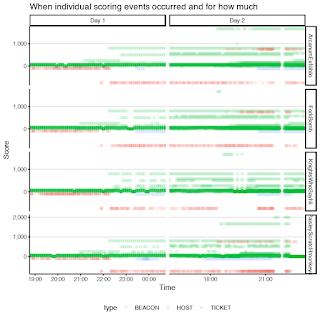 But there's more to consider such as the contributions of individual hosts and Beacons to score. 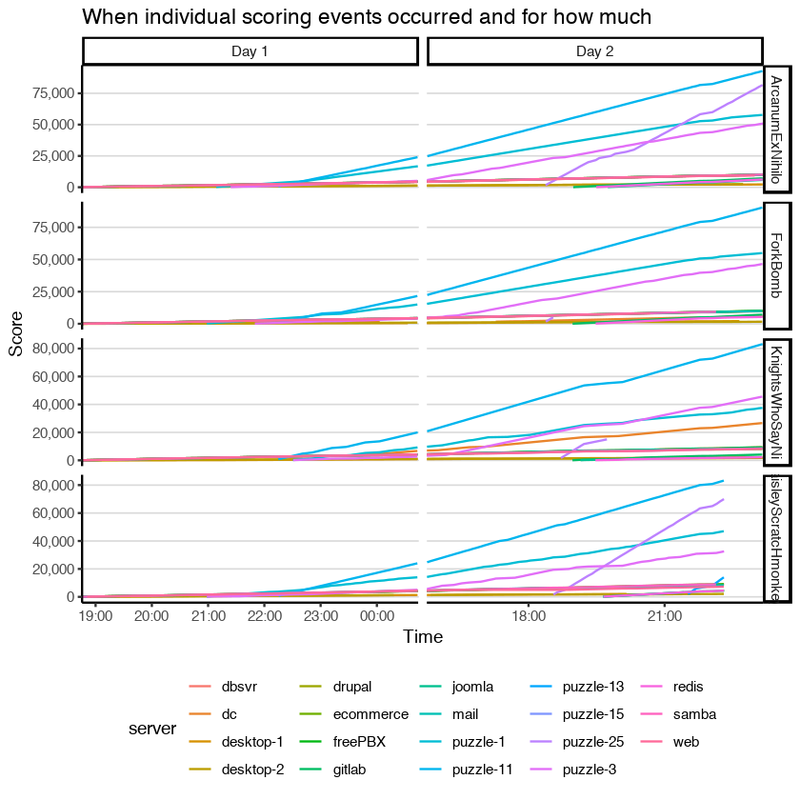 It's also useful to look at the score of each server relative to the other teams. Here it is much easier to notice the absence of the Drupal server (removed due to technical issues with it). 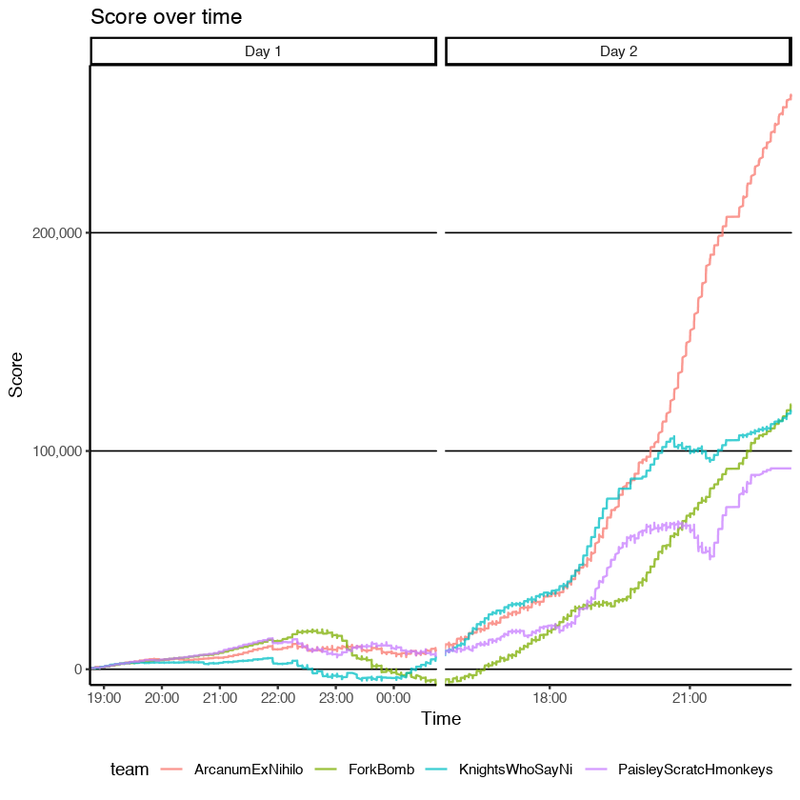 We also notice some odd scoring for puzzle servers 13 and 15, however the contributions are minimal. 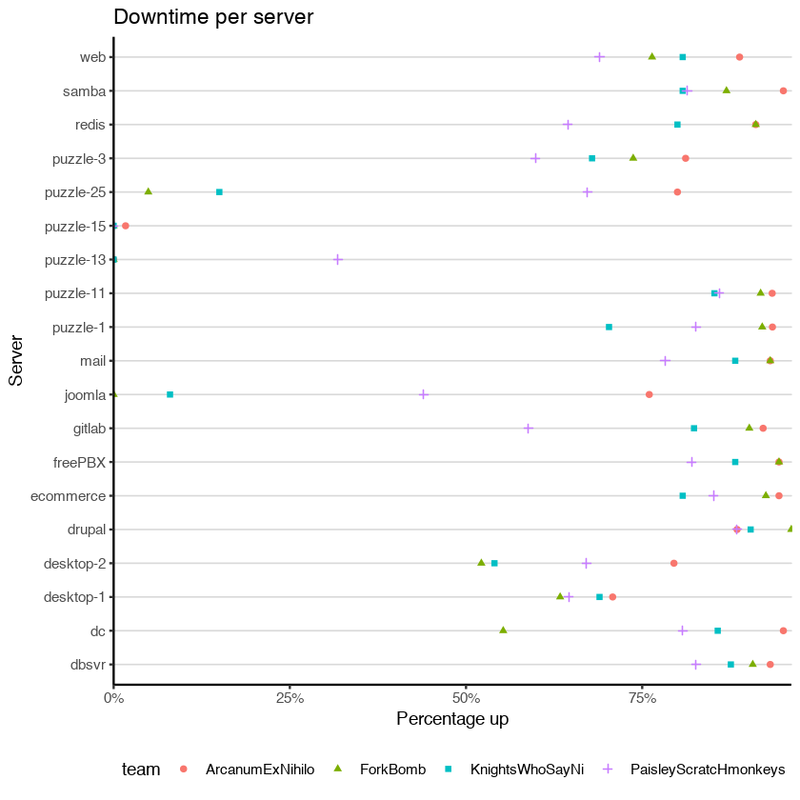 More interesting are the differences in scoring for servers such as Redis, Gitlab, and Puzzle-1. 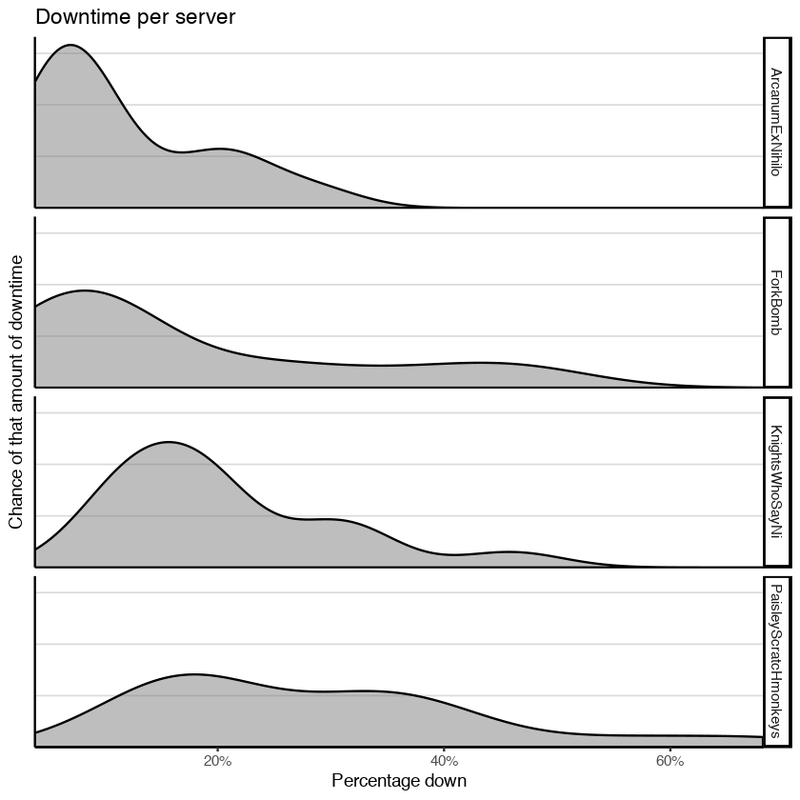 This suggests maybe these servers are harder to defend as they provided score differentiation. Also, we notice teams strategically disabling their domain controller. This suggests the domain controller should be worth more to disinsentivize this approach. 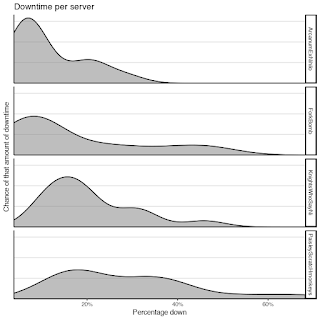 Finally, for the purpose of modeling, we'd like to understand downtime. 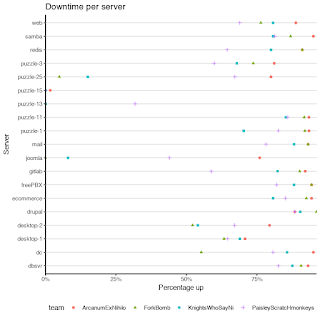 It looks like most servers are up 75% to near 100% of the time. We can also look at the distributions per team. We will use the distribution of these points to help inform our simulations for the next game we play. 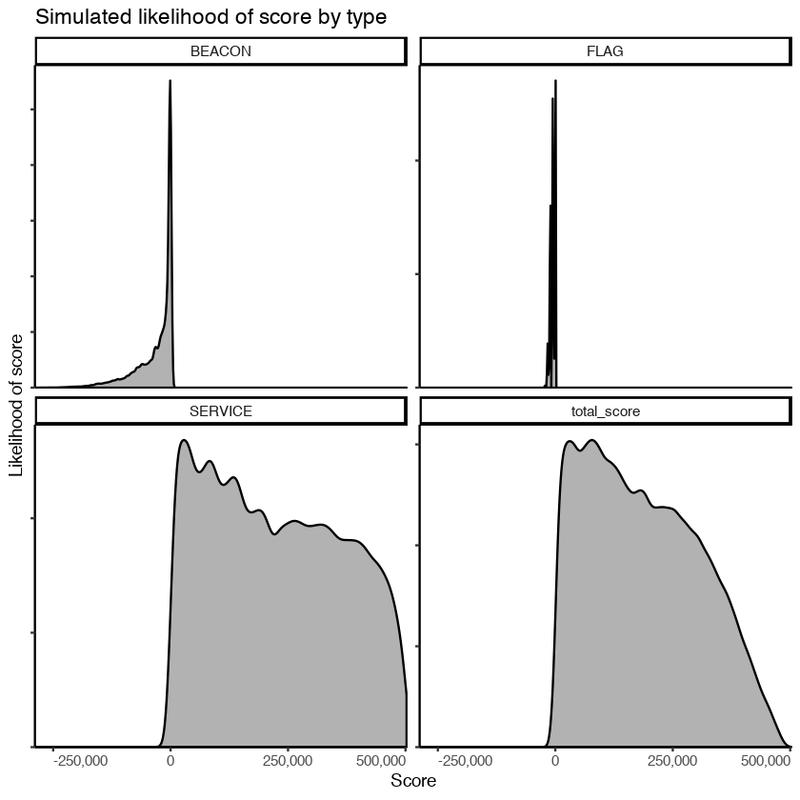 We are actually lucky to have a range of distributions per team to use for modeling. 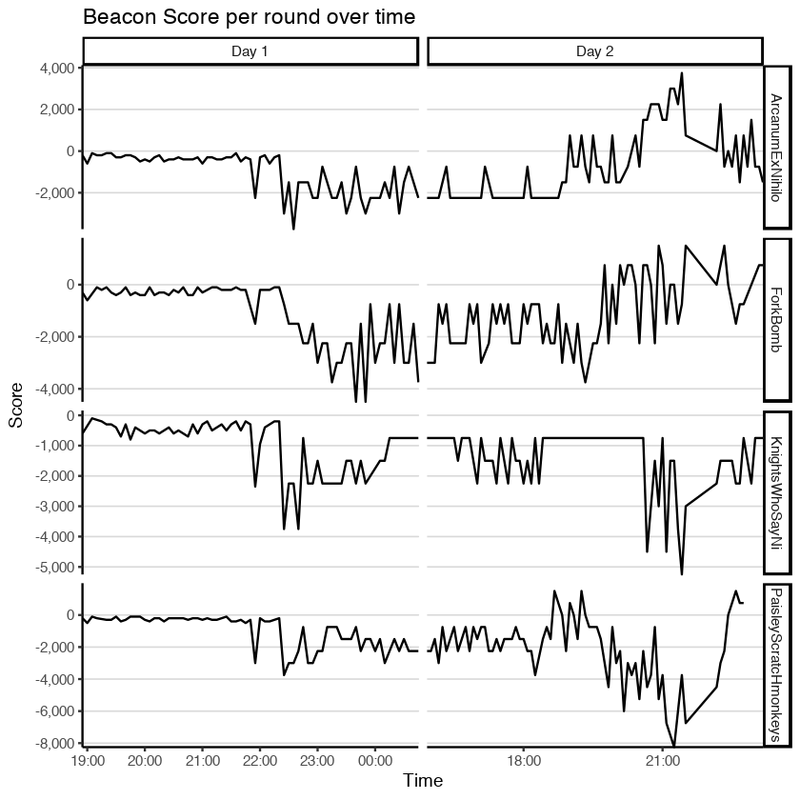 For the purpose of this analysis, we consider a beacon new if it misses two scoring rounds (is not scored for 10 minutes). 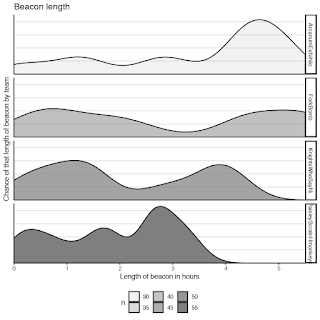 First it's nice to look at the beacons over time. (Note that beacons are restarted between day 1 and day 2 during analysis. This doesn't affect scoring.) I like this visualization as it really helps show both the volume and the length of beacons and how they varied by team. 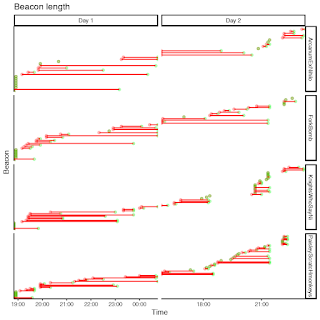 You can also clearly see the breaks in beacons on day two that are discussed above. In conclusion, the take-away is certainly not how any given team did. As the movie "Any Given Sunday" implied, sometimes you win, sometimes you lose. What is truly interesting is both our ability to attempt to predict how the game will go as well as our ability to then review afterwards what actually happened in the game. Hopefully if this blog communicates anything, it's that the scoreboard at the end simply doesn't tell the whole story and that there's still a lot to learn! This blog is about scoring from the 2018 BSides Las Vegas PvJ CTF so doesn't go into much detail about the game itself. There's a lot to learn on the PvJ website. we are also in the process of streamlining the game while making the game more dynamic. As mentioned above, the process started in 2017 and will continue for at least another year or two. Last year we added a store so teams can spend their score. We also started treating score as a currency rather than a counter. This year we added additional servers coming on and off line at various times as well as began the process of updating the gray team's role by allowing them to play a puzzle challenge hosted on the blue team servers. In the next few years we will refine score flow, update the gray team's ability to seek compensation from the gray team for poor performance, and additional methods to maximize blue team's flexibility in play while minimizing their requirements. Look forward to future posts as we get the details ironed out! Every year new people come to Las Vegas for the triumvirate of conferences, Blackhat, Defcon, and BSidesLV, better known as hacker summer camp. If you've never been, it can be an intimidating experience. To help those who might be interested in some suggestions, I've compiled the list below from my own experience (starting with Defcon 13). Think about what you want to get out of it. BH and DC are BIG. You can easily spend the entire time just wondering. You'll learn a lot about the conferences, but not necessarily security. Plan half a day to walk around and just see things, but have a better plan after that. Pick a few talks to go to (and wait in line for). Pick a village to sit in all day (I'm partial to BSidesLV Ground Truth as I help run it). Schedule to meet people (something I do a lot). Thursday is a down day. The schedule says there's stuff going on, but not a lot. DON'T plan to wonder on Thursday. Nothing will be ready. Plan to do something on the schedule. Meet up with people. Volunteer. Visit the Grand Canyon. But don't just assume you'll have stuff to do. Wear shorts. Most people will be in black t-shirts. You don't have to. a t-shirt, polo, or even short sleeve button-down is fine. Just don't do slacks and long sleeves. it's HOT. Wear comfy shoes but don't stress over it. Whats comfortable at home will be comfortable there. I wear a pair of dock shoes (sparreys). I prefer to get a microwave and get some food, especially breakfast food, to eat in my hotel room. Food tends to be a huge portion of the cost of going and eating a bagel and some fruit and yogurt in your room for breakfast can help keep you grounded. Speaking of being grounded, Las Vegas is a city of haves and have nots. You'll be living the good life, pampered by vendors, etc. Consider giving to those who don't have by volunteering at or donating to the Las Vegas Rescue Mission (https://vegasrescue.org/) or such. Speaking of parties, go to one, but most are going to be either loud, over-crowded, and obnoxious or hard to get into and pretentious. (There are a very few that facilitate socializing like the bsides las vegas pool party.) Better though to go to bed early and try and have breakfast with new people each day. 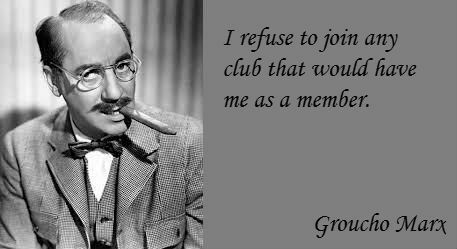 I generally follow groucho marx's rule for parties. Go to some talks. Lots of people put a lot of work in to talk about lots of things. And not just the big showie talks. Those tend to be spectacle. Instead find lesser known people talking about their passion. And plan to get in, talks have waiting lines that can be LONG. Especially at defcon. And see a show or two. Go to the day-of discount booth and get tickets to some big show (Every casino has one) but also to the little lounge shows (Burlesque, Hypnotist, Comedy, etc). Ask the hotel what smaller shows they have and what others are around. don't bother gambling. Your time around many of the best security professionals in the world is limited. Don't waste it on throwing your money away. You can do that any time. Don't plan to go back to your hotel room. Put everything you need for the day in a bag and go (water, snacks, clothes, batteries, etc). That includes electronics, extra power, water, and clothes if changing for the evening, (whether an extra t-shirt to replace your sweaty one or your slacks for a nice evening out). It can take you an hour to get back to your hotel and back out again and you don't want to waste that. Take one set of nice clothes (business casual, maybe a tie and jacket, in case you want to go somewhere nice one night. Make SURE to bring close-toed shoes. Some nice restaurants will refuse you in sandals. (goes for women too). Bring extra power. The wireless environment is FLOODED. it will DRAIN all your devices. I can drain the battery in every device I bring 2-3 times a day. USB batteries are a MUST and if you don't need the wifi on on your device, just leave it off. Read this blog: How to Converse Better in Infosec and this one: How to Handle Being Questioned on asking & receiving questions. Remember that blocks in Las Vegas are about a mile. Don't look at google maps and think "it's only one block". If you see someone you recognize in infosec (a speaker you look up to, a company CEO, etc), walk up and say "Hi. I'm <your name>. I love your work. I'm curious about what you're interested in these days." If they excuse themselves, that's fine. They may be in between things. (I've heard of people taking an hour or more to get from the hotel lobby to their room because they meet so many people that know them along the way.) If they mumble something, that's ok. After talks particularly speakers are worn out mentally. If they tell you off, that's ok. Some people are jerks. But none of those things cost you anything and the potential for a good conversation is HUGE. If you see someone you _don't_ recognize, say "Hi. I'm <your name>. What brings you here?" Again, they could not talk to you for any number of reasons, but I have met all sorts of super interesting people just being willing to meet with whoever is willing to meet with me. Lots of people like badges. Some are super cool. I'll be honest, all my old badges, electronic or not, are hanging in my closet taking up room I need for other things. If you want a fancy defcon badge, get a badge early as they tend to run out and then hand out paper. If I get a fancy badge and they run out, I tend to trade it to someone whose there for the first time who doesn't have one. I've got enough badges and your first defcon badge is special. The minimum rule is 1 shower, 2 meals, and 3 hours of sleep. Personally, I get a full nights sleep, I eat all my meals, and of course shower and use deodorant. I'm sure there's much more I'm forgetting. I'll update it if I think of anything else. Also, you can search twitter for #gooddefconadice (or #baddefconadvice) but take it with a grain of salt. This year as I prepared for my RSA talk, Building a Data-Driven Security Strategy, I decided to do something slightly different. 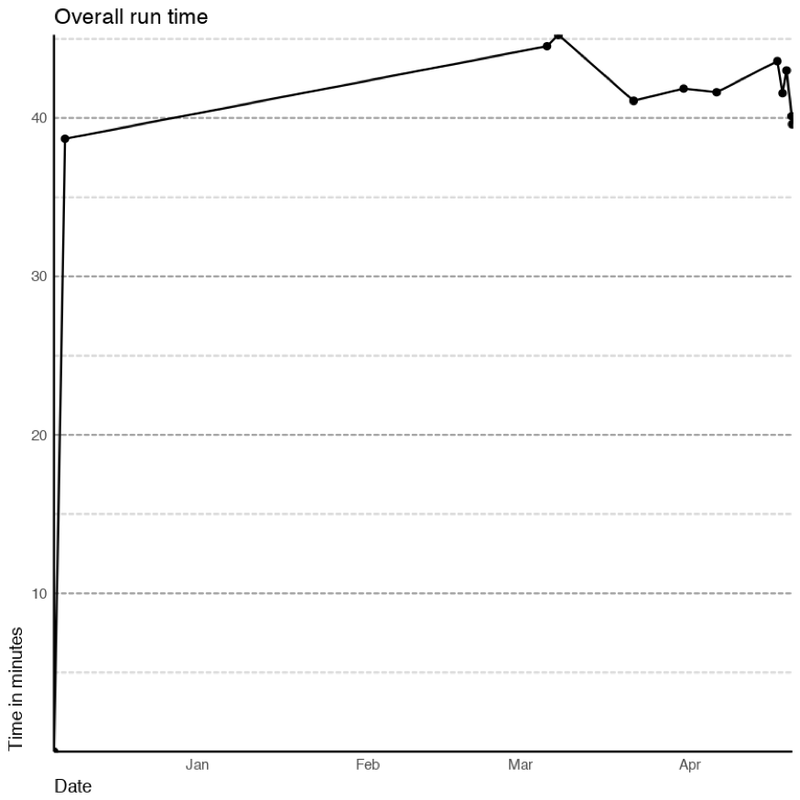 I modeled my timing practice after video game speedrunners. Ultimately it was a good experience that I plan to repeat. Here's the story. 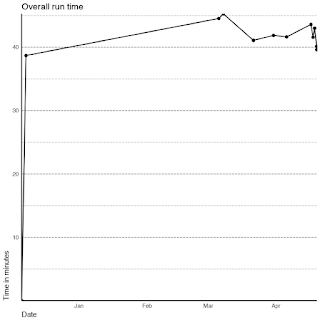 One thing they all have in common is they use software to measure how long the attempt (known as a run) takes. Most break the runs down into sections so they can see how well they are doing at various parts of the game. To do this, they use timing software which measure their time per section, and overall time. Additionally, each run is individually stored and their current run is compared to previous runs. 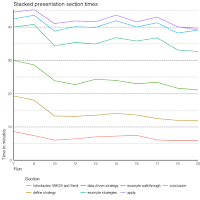 This struck me as very similar to what we do for presentations, and so for my presentation, I decided to use a popular timer program, livesplit (specifically livesplit one) to measure how well I did for each practice run of my presentation. Basically, every time I practiced my presentation, I opened the timer program and at each section transition, I clicked it. 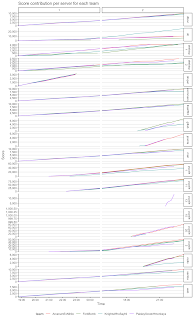 While the practice run was going, the software would indicate (by color and number) if I was getting close to my comparison time (the average time for that section). 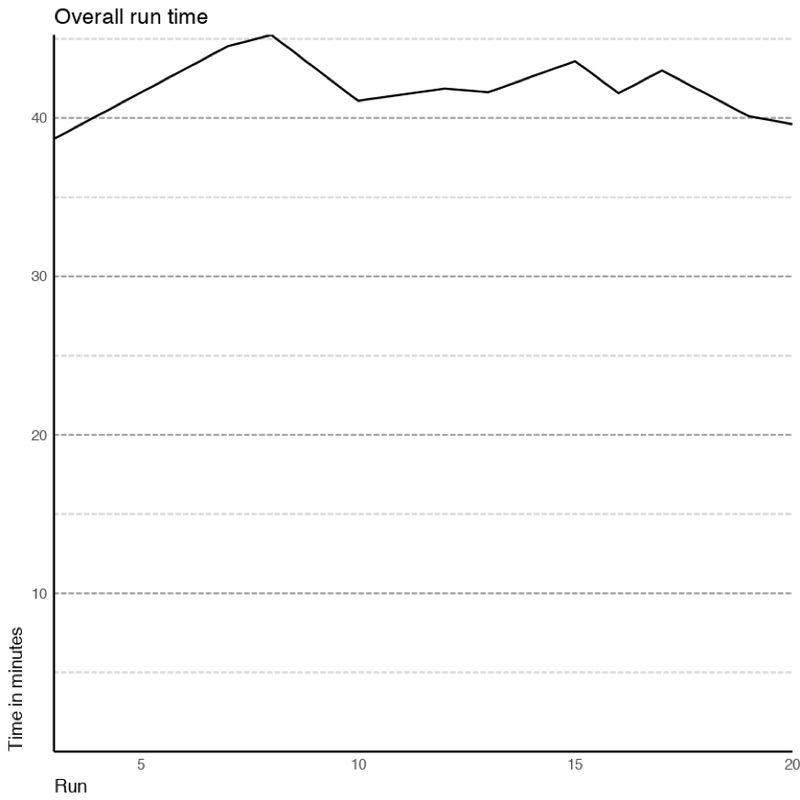 Each individual run was then saved in a livesplit xml file (.lss). I’ve attached mine for anyone that wants to play with it here. The initial sections analysis (Figure 1) showed some somewhat dirty data. First, there probably shouldn’t be a run -1. Also, runs 4 and 5 look to not be complete. So we’ll limit our analysis to runs 7 to 20. For some reason, The introduction section in runs 9, 14, and 18 seems to be missing, so we’ll eliminate those times as well. It’s worth noting that incomplete runs are common in the speedrunning world and so some runs where no times are saved will be missing and other runs where the practice was cut short will exist as well. 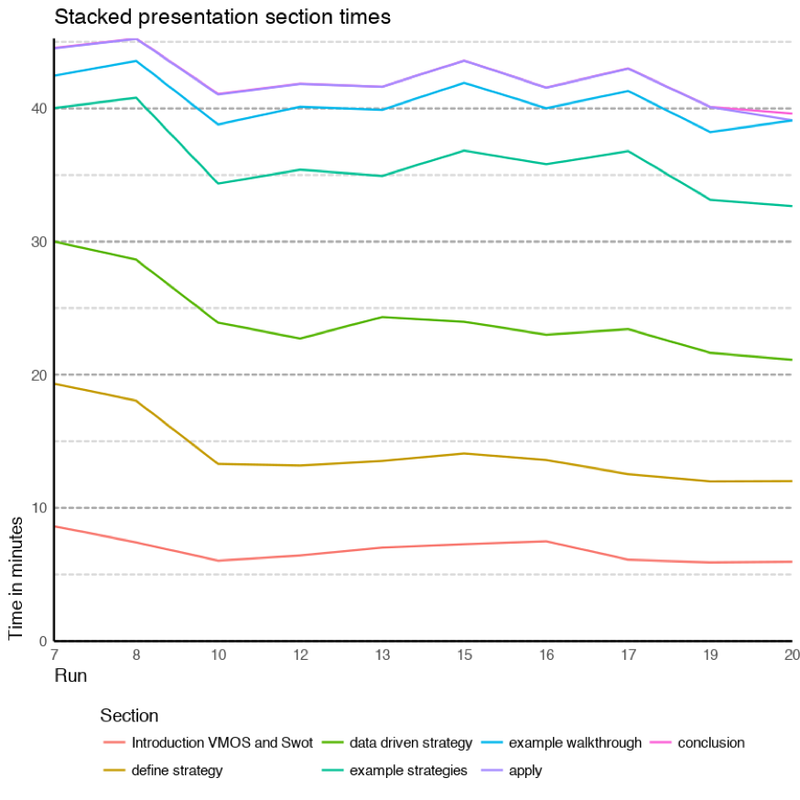 It’s also relevant that ‘apply’ and ‘conclusion’ were really mostly the same section and so I normally let ‘apply’s split run until the end of the presentation, making ‘conclusion’ rarely occur at all. Figure 2 and 3 look much better. A few things that start popping out. First, I did about 20 practice runs though the first several were incomplete. 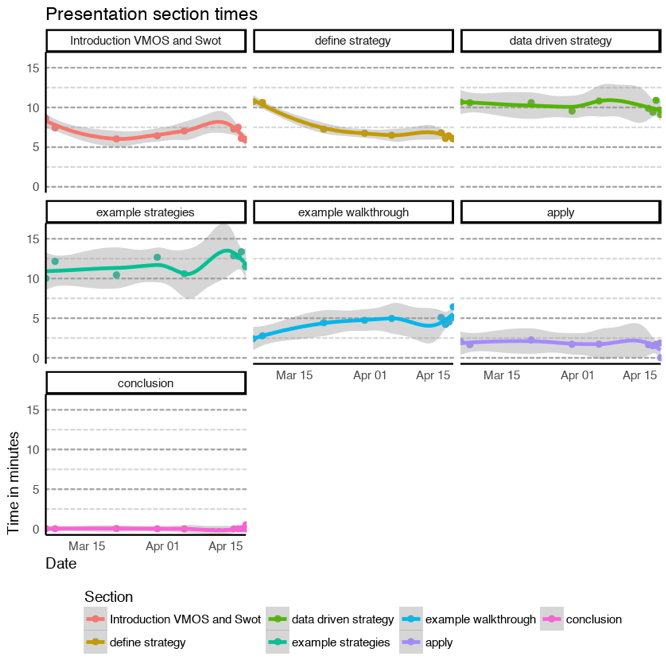 Looking at Figure 2, we see that some sections like ‘introduction VMOS and Swot’, ‘apply’, and ‘data driven strategy’ decrease throughout the practice. 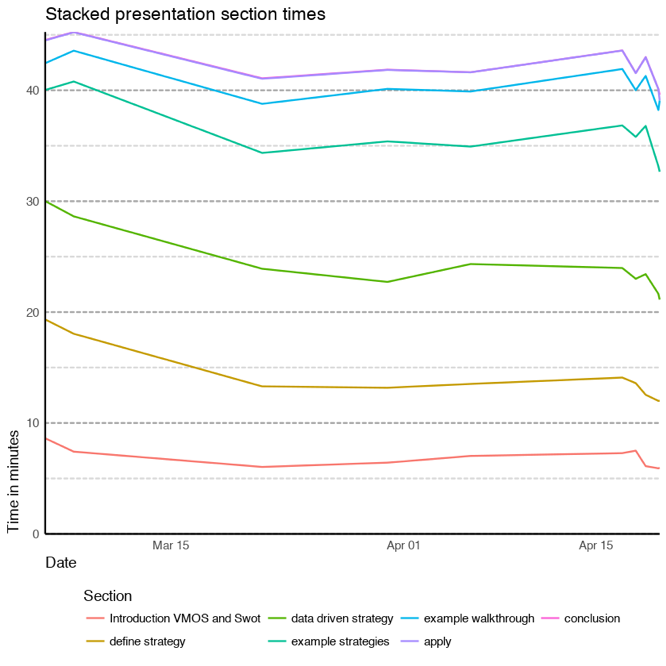 On the other hand, ‘example strategies’ and ‘example walkthrough’ increased at the expense of ‘define strategy’. This was due to pulling some example and extra conversation out of the former as feedback I got suggested I should spend more time on the latter. 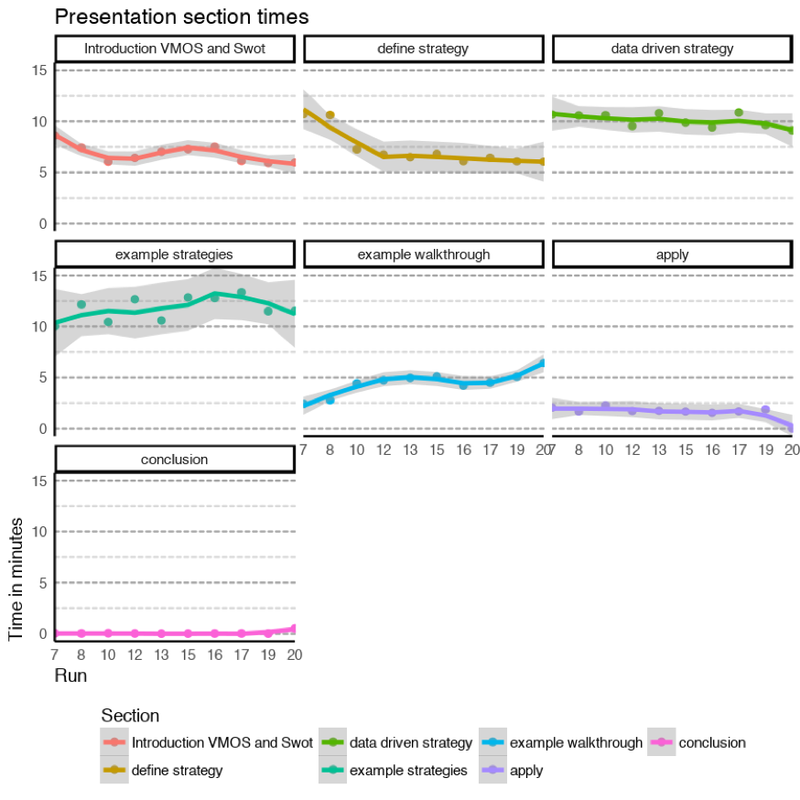 Ultimately it looks like a reduction of about 5 minutes from the first runs to the final presentation on stage (run 20). The file also provides the overall time for each time. Figure 4 gives a quick look. We can compare it to Figure 3 and see it’s about what we expect. 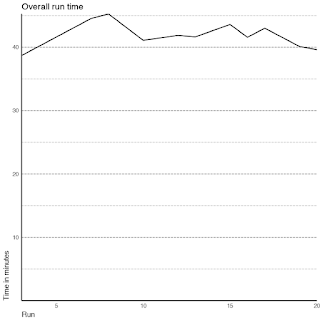 A slight decline from 45 to 40 minutes in runtime between run 7ish to run 20. We can also look at actual practice days instead of run numbers. Figure 5 tells an interesting story. I did some rough tests of the talk back in December. This was when I first put the slides together in what would be their final form. Once I had that draft together, I didn’t run it through January and February (as I worked on my part the DBIR). After my DBIR responsibilities started to slow and the RSA slide submission deadline started to come up, I picked back up again. The talk was running a little slow at the beginning of march, however through intermittent practice and refinement I had it down where I wanted it (41-43 minutes) in late March and early April. I had to put off testing it again during the week before and week of the DBIR launch. After DBIR launch I picked it up and practiced it every day while at RSA. 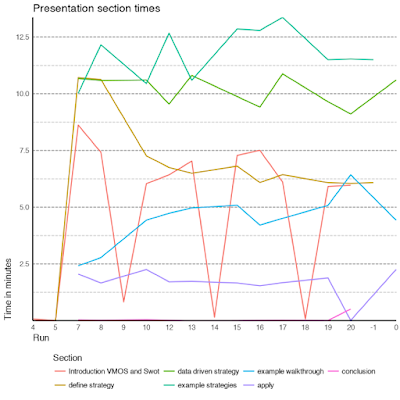 It was running a little slow (2 runs over 43 minutes) at the conference, but the last run the morning of was right at 40 minutes with the actual presentation coming in a little faster than I wanted at 39 minutes. We can take the same look at dates, but by section. Figures 6 and 7 provide the story. It’s not much of a difference, but it does put into perspective the larger changes in the earlier runs as substantially earlier in the development process of the talk. Ultimately I find this very helpful and suspect others will as well. I regularly get questions such as “how many times do you practice your talk?” or “how long does it take you to create one”. 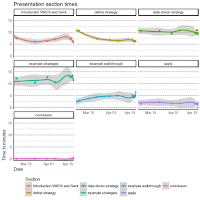 Granted it’s a sample size of 1, but it helps give an idea of how the presentation truly evolved. 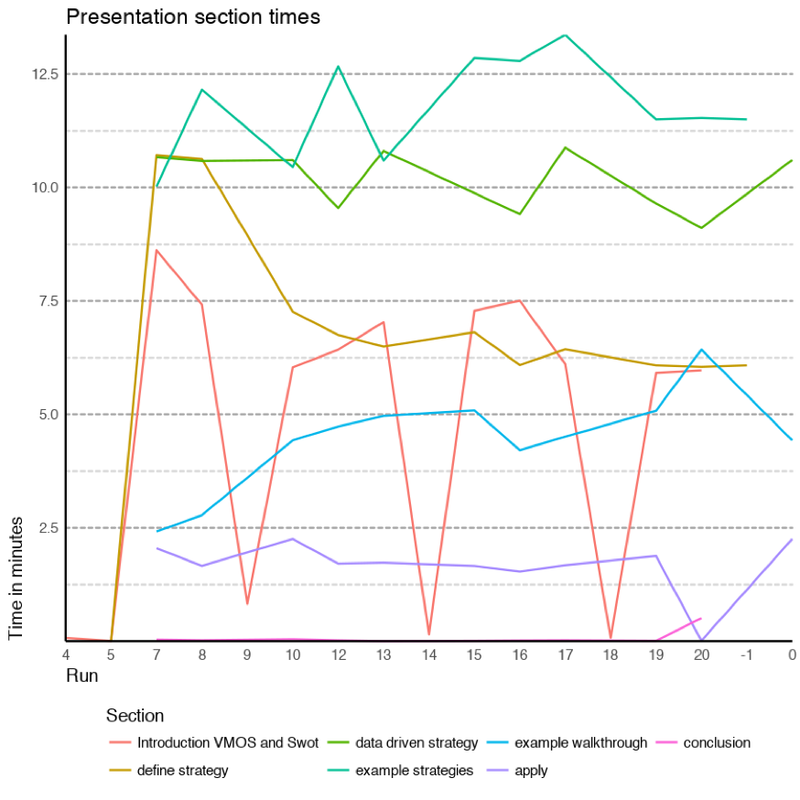 I can also see how the changes I made as I refined the presentation affected the final presentation. Hopefully a few others will give this a try and post their data to compare! Oh, and for those adventurous types, you can see the basic analysis I did in my jupyter notebook here. Type-1 is mostly single-step attacks. 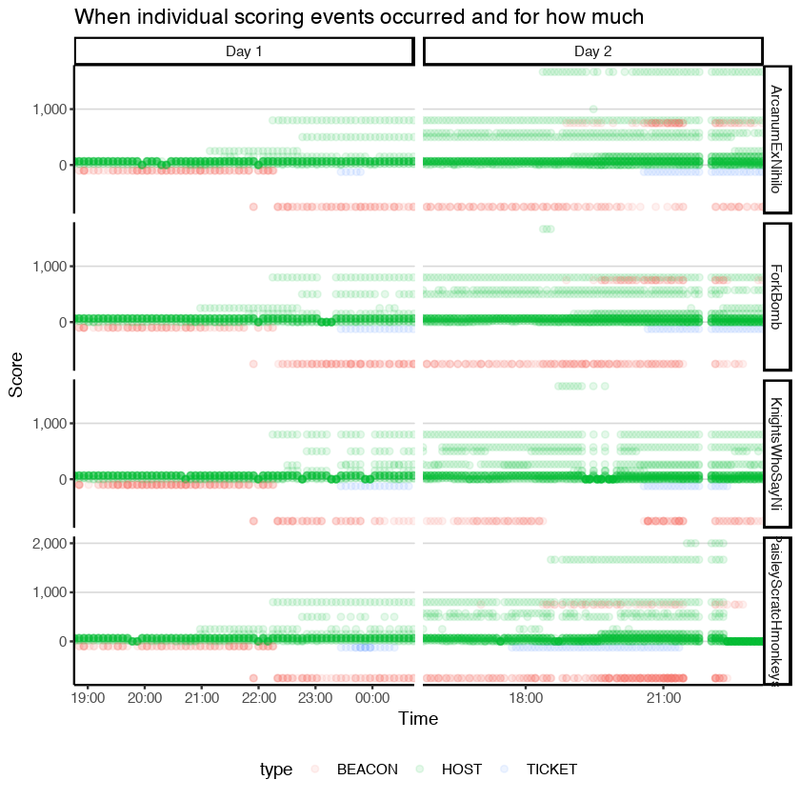 Attackers invest in a single action and then immediately get the return on that investment. These could be ransomware, DoS, it shoautomated CMS exploitation, or phishing leading to stolen credentials, to compromised bank accounts. Type-2 includes most of what we traditionally think of as hacking. Multi-step attacks including getting a foothold, pivot internally, and exfiltrate information. Not-petya attacks would fall in here as would the types of hacks most pen testers simulate. Section one in the above figure is driven by risk from type-1 attacks. If you are vulnerable to these, you are just waiting your turn to be breached. Sections two and three relate to type-2 attacks. In section two, your defenses, are good enough to stop type-1 attacks, but are likely not good enough to stop attackers willing and able to execute type-2 attacks. This is because, having an ability to execute a multi-step attack flexibly, the threat here has many different paths to choose from. If you either aren't studying all of your attack paths in context with each other, or are simply not able to handle everything thrown at you, the attacker gets in regardless of what security you do have. 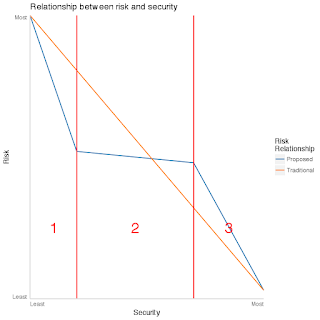 As such, the primary driver of risk is attacker selection (mostly unrelated to your security). 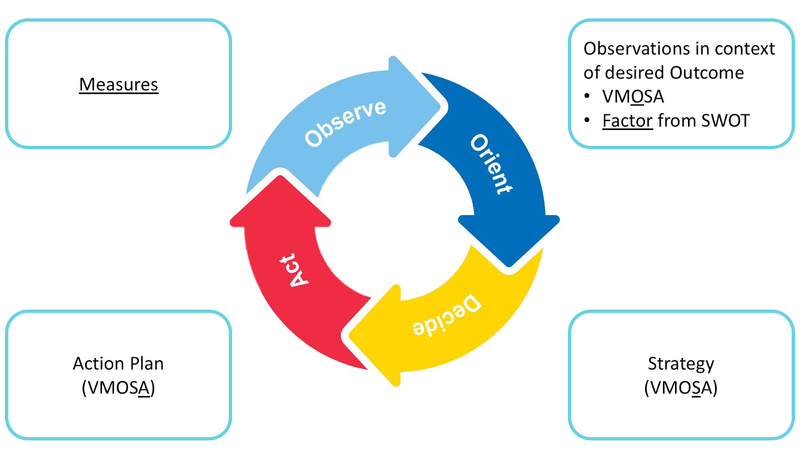 Once your security reaches section three, you start to have the path analysis and operational abilities to stave off attacks that can flexibly take different paths. As such, the more you improve, the more you see your risk go down (if you can measure it). The first takeaway is that if you are in section one, you are a sitting duck. Automated attacks will find you on the internet and compromise you. Imagine the attackers with a big to-do list of potential victims and some rate at which they can compromise them. You are on that list somewhere, just waiting your turn. You need to get out of section one. The second takeaway is that if you are better than the first section, it doesn’t really matter what you do. Increasing your security doesn’t really do anything until you get to a pretty darn mature point. All the actors looking for a quick ROI are going to be focused on section one. There are so many victims in section one that to target section two they would literally have to stop attacking someone easier. Even as type-2 attacks become commoditized, there’s absolutely no incentive to expand until either all of section one victims are exploited or the type-2 attack becomes a higher Return on Investment (ROI) than an existing type-1 attack. Here, because the attacks are type-2 attacks, the biggest predictor of if you will be breached is if you are targeted. That is, until you get to section three. 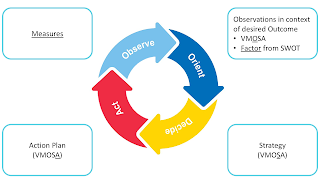 In this section, security has started to improve to the point where even if you are targeted, your security plays a significant role in if you are breached or not. These are the organizations that 'get it' when it comes to information security. The reality is most organizations probably are not able to get here, even if they try. The investment necessary in security operations, advanced risk modeling, and corporate culture are simply outside the reach of most organizations. Simply buying tools is not going to get you here. On the other hand, if you're going to try to get here, don't stop half-way. Otherwise you've wasted all investment since you left section one. There is another scenario where someone not engaged in section one decides to go after the section two pool of victims with an automated attack. (Something like not-petya would work.) If this was common, it'd be a different story. However, there's no incentive for a large number of attackers to do this (as the cost is relatively fixed, and multiple attackers decreases the available victims for each). In this case, the automated attack ends up being global news because it's so wide-spread. As such, rules are created, triage is executed, and, in general, the attacker would have to continue significant investment to maintain the attack, decreasing the ROI. Given the easy ROI in section one, the sheer economics will likely prevent this kind of attack in section two. Without testing, it's relatively hard to know in which section you are in. Pen testing might tell you how well you do in sections two and three, but knowing you lose against pen testers doesn't even tell you if you are out of section one. Instead, you need security unit testing to replicate type-1 attacks and verify that your defenses mitigate the risk. If you never beat the pen testers, you're not in section three. However, once you start to be able to handle them, it's important to measure your operations more granularly. Are you getting better in section three or slipping back towards section two? That means measuring how quickly operations catches threats and what percent of threats they catch. 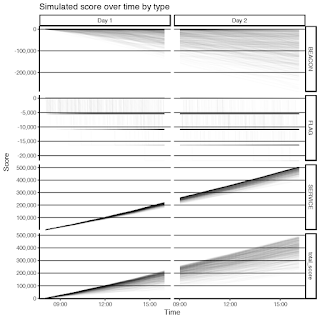 Again, automated simulation of a type-2 attacks can help you capture these metrics. Most organizations should be asking themselves "Am I in section one and, if so, how do I get out?" Even if you aren't in section 1, commoditization of new attacks may put you there in the near future. (See phishing, botnets, credential stuffing, and ransomware as examples over the last several years.) 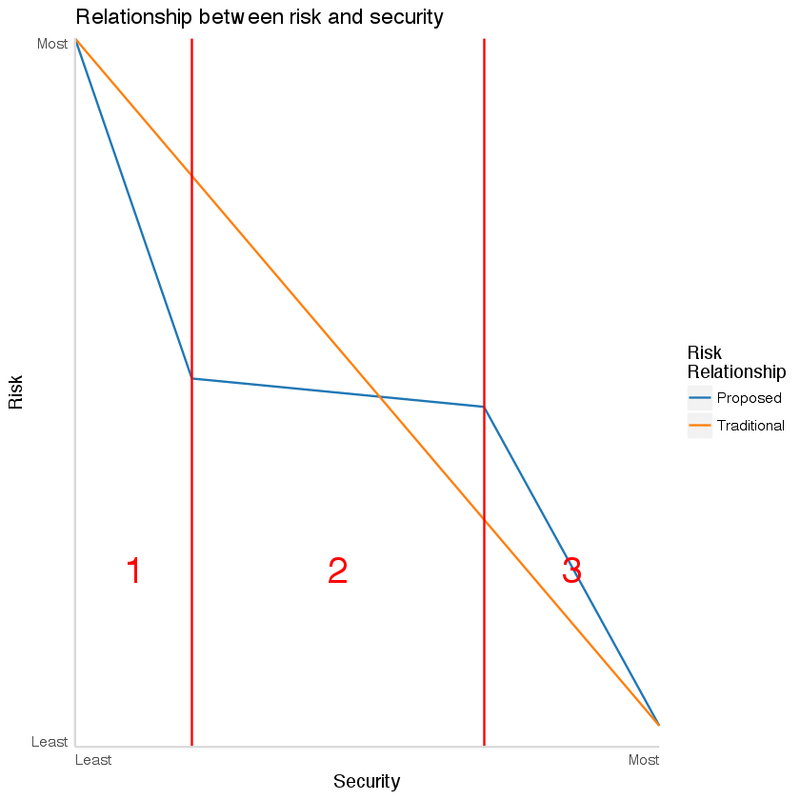 You need to continue to invest in security to remain ahead of section one. On the other hand, you may just have to accept being in section two. You can walk into an organization and, in a few minutes know whether they 'get it' or not when it comes to security. Many organizations will simply never 'get it'. That's ok, it just means you're not going to make it to section three so best not to waste investment on trying. Better to spend it to stay out of section one. However, for the elite few organizations that do 'get it', section three takes work. You need to have staff that can close their eyes and see your attack surface with all of your risks in context. And you need a top-tier security operations team. Investment in projects that take three years to fund and another two to implement may keep you out of section one, but it's never going to get you into section three. To do that you need to adapt quickly to the adversary and meet them toe-to-toe when they arrive. That requires secops.